Elm City Dance Collective and friends from the community will embrace this years City Wide Open Studios' theme, "Wellbeing" through visually evocative movement that reflects the performers' humanity and pays homage to the site they will be performing at, Yale University's West Campus. 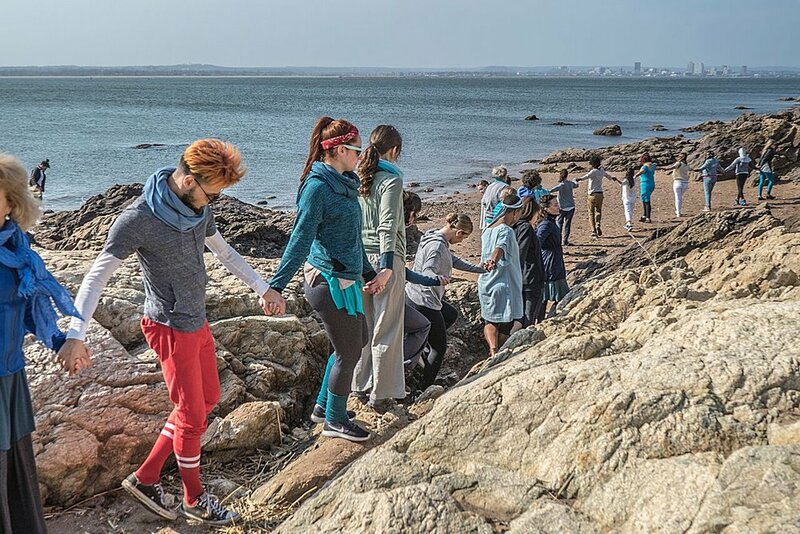 The performers will embody the essence of wellbeing through movement that engages the space and physically expresses metaphor inspired by contemplative practices and ritualistic ways of being in community. Seen from the outside, performed inside within the glass walkway connecting the Yale School of Nursing to Building #410. Conceived directed by Kellie Ann Lynch in collaboration with the performers. Click here for performance times. Through the Echoes was commissioned by Artspace New Haven. People In Motion is a movement and performance project for adult non-movers and movers alike. ECDC invites people to experience the power of dance through the practice and performance of making dance in the moment also known as dance improvisation or compositional improvisation. ECDC is looking to help people remember what their bodies are capable of and how great it feels to connect with other human beings through the art of dance and dance making. This project involves a 3-4 class/skill building structure; a weekend-long workshop; and a final performance by the participants. Conceived and directed by Kellie Ann Lynch in collaboration with the dancers. People in Motion 2016 was supported by the Arts Council of Greater New Haven.